Ray was born and raised in Highcliffe, Dorset where he had the beach at his front door and the New Forest at the back door. As a child he was always out with friends in the local woods or fields or on the neighbour’s smallholding, camping out as soon as they were deemed old enough. This love of the outdoors did not go unnoticed. 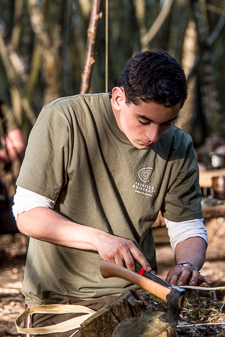 Ray attended his first bushcraft course at the age of 13, on a Woodlore family weekend. The next year he was back, doing the week-long Junior Fundamentals course, which is where he first met James and Paul. Ray then met them again in 2012 on a Frontier Bushcraft course. After completing his A-levels, Ray spent 5 months wild camping his way round New Zealand, practicing and refining many of his bushcraft skills. On his return he was taken on by Frontier to do some work experience for 2 weeks – and ended up staying for quite a bit longer, assisting on 10 courses at both beginner and intermediate levels. Ray studied product design because he has always loved creating things, and he likes to bring that creativity into the woods. For example, he was able to help one client with mobility issues by re-designing a bow drill to enable them to create fire by friction. Ray says "This is one of my favourite aspects of teaching: helping people to achieve something they previously thought impossible." When not working for Frontier, Ray works at The Chewton Glen, a 5-star hotel in Dorset, which he reckons has improved his cooking skills – something else he likes to bring into the woods with him. Outside of work Ray enjoys sailing Blokart land yachts, surfing, wood turning and carving. After his summer of work experience in 2013, Ray was invited to join the Frontier instructional team as a Course Assistant for the 2014 course season.